In addition to slips and falls on the ice, shoveling the driveway is a common cause of back injuries during the winter months. As is the case with most low back injuries, prevention is the most the most important thing to know. Here are 7 tips can help you avoid low back injuries during the icy and snowy winter season. This may sound strange, but not all shovels are created equal. There are “ergonomic” snow shovels that can help reduce the pressure on your back while shoveling snow. These strange looking shovels with the bent handles will minimize excessive bending and allow you to bend your knees only slightly and arch your back very slightly while keeping the shovel blade on the ground. Spend 5 to 10 minutes stretching before heading out to shovel that driveway. Doing stretches for the legs, back and shoulders will loosen up your body and make your shoveling safer for your back. Sit in a chair with your legs extended out in front of you and gently lean forward reaching for your feet. This stretches your hamstrings and is a great way to prevent lifting injuries. You can also try shoveling after going for a short walk, when your muscles are looser and warmed up. Shoveling small amounts of snow frequently is less strenuous than shoveling a large amount at once. Spend only 15-20 minutes at a time shoveling the snow. Put the shovel down and go do something else. After a short break, return to shoveling for another 15-20 minutes. If you have a massive amount of snow to move, if possible, removing snow over a period of days. In deep snow, remove a few inches off the top at a time, rather than attempting to shovel the full depth at once. 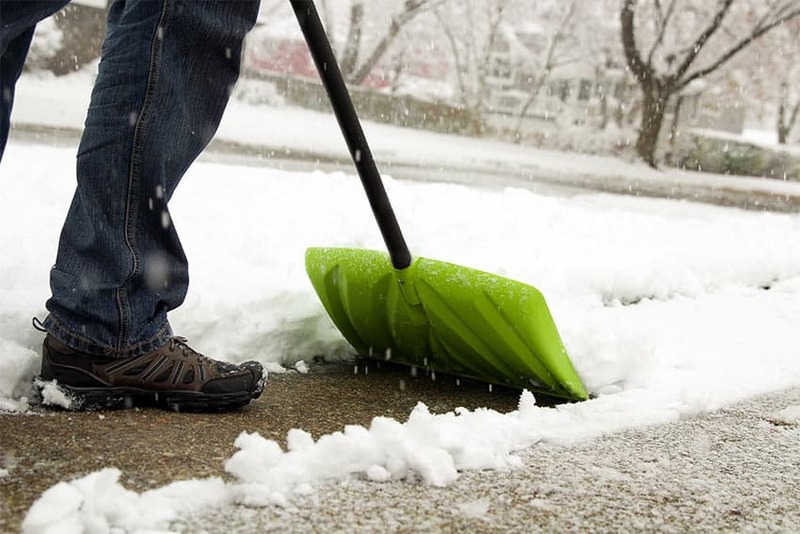 Slippery conditions while shoveling can lead to slipping and/or falls and strains that can injure your back. Shoes or boots with good treads will help to minimize injuries from slipping. You can buy ice and snow grips for your shoes or boots. They are an inexpensive and very useful tool to help prevent slips and falls. Spread sand or rock salt on your sidewalk or driveway to increase traction and reduce the likelihood of slipping on the ice. If you live in an area where there is plentiful snowfall, a snow blower becomes a common sense and good investment. When used correctly, a snow blower can put less stress on your low back than shoveling. Avoid stressing your back by using the power of your legs to push the snow blower while keeping your back straight and knees bent. Having a properly aligned spine is essential to prevention of back injuries. Poor posture represents weakened, damaged and injured areas of the spine. If your Posture isn’t looking so good, it’s time to get it checked. Call our office for a free computerized postural analysis.